Georgia expects foreign investment in the ex-Soviet republic to double to $1 billion this year, with energy and tourism sectors leading the way, its economy minister said Wednesday. Vera Kobalia told Reuters Insider that foreign investors were lining up to participate in hydroelectric power projects and the burgeoning tourism sector on the country's Black Sea coast as well as in its mountainous regions. "It's definitely a sign of what's to come," Kobalia said, referring to a contract signed by U.S. property mogul Donald Trump in March to build two 40-story skyscrapers in Georgia. "A group headed by the vice president of Trump Organization in Georgia was analyzing every little detail, and finally they've concluded that this is a market to invest in, this is really the next Singapore or Dubai," Canadian-educated Kobalia said. She was visiting the Kazakh capital to attend a conference. The contract was signed by Trump and Georgia's Silk Road Group, one of the largest private investment companies in the South Caucasus region, and envisages the construction of towers in the capital Tbilisi and the resort town of Batumi. A number of hotels belonging to major international chains have sprouted in both places in the last few years. "When we were celebrating the deal in New York, there was a lot of interest from the business community in the United States and also, generally, in foreign direct investments in Georgia," Kobalia said. "We can definitely reach around the $1 billion mark." Foreign direct investment in Georgia fell 16 percent in 2010 year on year to $553 million, official data show, well below a $1 billion target already set for last year. Nevertheless, FDI still accounted for 5 percent of gross domestic product in 2010. Georgia also placed a $500 million 10-year eurobond last month with a coupon rate of 6.79 percent and tendered to buy back $416.7 million worth of its outstanding $500 million 2013 eurobond via an "any and all" tender ahead of a new issue. The International Monetary Fund, which forecasts economic growth of 5.5 percent in Georgia this year versus 6.4 percent in 2010, has said the eurobond issue should help spur greater FDI. 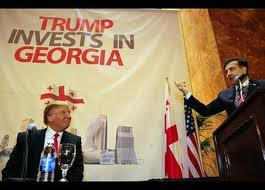 Georgia's investment-driven economy was hit by a five-day war with Russia in August 2008 and then the global crisis, which slashed foreign investment. Foreign aid helped plug the gap. Kobalia said recent improvements in the country's sovereign ratings outlook should help restore confidence. Ratings agencies Standard & Poor's and Fitch both raised their outlook for Georgia to "positive" in March. "It's a misconception that political risk still exists," the 29-year-old minister said. "The ratings agencies have upgraded us in the last little while. "That's another indication that the risk is definitely stabilizing, or evaporating." Kobalia highlighted tourism and hydroelectric power among the most attractive sectors for foreign investors. She said Georgia was using only 18 percent of the hydropower that it generates and was exporting the rest to neighboring countries. "Turkey, our neighbor, has a deficit already so it's a great investment for companies to build HPPs [hydropower plants] and to transfer electricity to Turkey," she said. Georgia was also offering investors a 15-year tax break on investments in two tourism sites in the Black Sea, she said. Energy Minister Alexander Khetaguri told Reuters in an interview in February that investors from the Czech Republic, Russia, Turkey, Estonia, Lithuania, South Korea and the United States have invested in constructing new hydropower plants, electricity lines and distribution firms.